Gordon Brown said today he was “increasingly confident” that Israel was willing to end settlement activity in the Palestinian territories. After talks with his Israeli counterpart, Binyamin Netanyahu, the prime minister said he was “as realistic as ever but more optimistic than before” about peace in the Middle East. “We share a vision of a secure and confident Israel accepted and welcomed by its neighbour alongside – after decades of waiting – a secure and viable Palestine in a region at peace with itself,” he said. 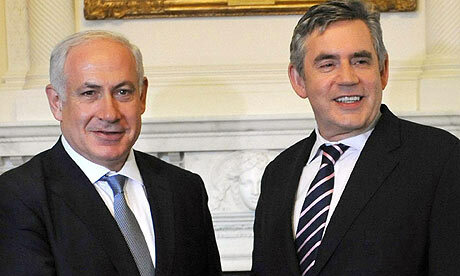 Speaking alongside Netanyahu in Downing Street, Brown said he had reiterated his call for an end to Jewish settlement building on Palestinian land. Netanyahu, who faces the same demands from the US president, Barack Obama, said he had made clear Israel would not build new settlements or “expropriate additional land”. But he stressed there was a need for facilities to enable “normal life” for Jewish settlers already in the West Bank. “This is very different from grabbing land,” he told reporters. He said Britain and Israel had “common hopes and common challenges”, but stressed the threat from Iran and the need for Palestinians to recognise Israel. Netanyahu said Israel had already moved to improve access to the West Bank. With the territory enjoying a period of calm, some Israeli military checkpoints have been lifted and permits for importing raw materials are being granted. Brown said he deplored Iran’s aggressive comments about Israel. “Such diatribe has no place in a civilised world,” he said. “We also share Israel’s concerns over Iranian ambitions to develop a nuclear weapon. Netanyahu is due to meet the US Middle East envoy, George Mitchell, tomorrow, and the German chancellor, Angela Merkel, in Berlin on Thursday. While Netanyahu will want to emphasise the potential threat from Iran if it acquires nuclear weapons, European leaders are expected to underline their concerns about the spread of Israeli settlements on occupied Palestinian land. In Washington the state department spokesman, Ian Kelly, said the US and Israel were “getting closer” to agreement on the resumption of talks. “I don’t want to go into the details of exactly why, but just to say that we’re hopeful that we can resume very soon,” Kelly said. Hefetz said Israel believed talks could be resumed within two months. Israeli government officials say a compromise under discussion could see Israel freeze building for nine to 12 months, but this will not include East Jerusalem or building that has already begun. The halt in approvals for new building was dismissed by Netanyahu’s critics. The settlement watchdog group Peace Now said there had been no real slowdown in construction and that settlers could keep building indefinitely, using plans that had already been approved. In a new report, Peace Now said Israeli defence ministry figures showed existing government approval to build more than 40,000 housing units in West Bank settlements. In his meeting with Mitchell, Netanyahu is expected to stress that Israel will not accept limits on its sovereignty in Jerusalem, in particular in relation to building new housing units in the city, the Israeli newspaper Ha’aretz reported. Mahmoud Abbas, the Palestinian president, has said he would resume peace talks with Israel, suspended since December, on condition of a freeze on settlement activity. Some 500,000 Jews live in the West Bank and Arab East Jerusalem, territory that Israel captured in the 1967 war and which is home to 2.5 million Palestinians. This entry was posted on 25/08/2009 at 7:21 PM and is filed under Everyday life in the West Bank, Fatah, International community, Israel, Israeli occupation, Palestine, Pictures, West Bank with tags Angela Merkel, Barack Obama, Binyamin Netanyahu, East Jerusalem, George Mitchell, Gord, Ian Kelly, Iran, Jerusalem, Jew, Jewish settlers, Mahmoud Abbas, Palestinian Authority, Peace Now, Peace process, sett, Settlements. You can follow any responses to this entry through the RSS 2.0 feed. You can leave a response, or trackback from your own site.